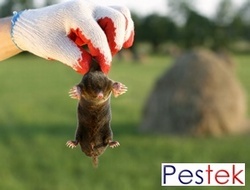 Mole Traps are the safest and most effective way to control moles. The design is quite simple, modern traps have the same basic design as traps that was in use a hundred years ago. There are quite a few trap designs on the market however they all fall into 3 basic categories Scissor, Tunnel and Claw traps. The Scissor is for the inexperienced mole catcher the easiest one to work with. Scissor traps are simple to set and don't need to be uncovered to see if a catch has been made.�dependent of the depth of the moles tunnel. The traps I use are the ones many other professional mole catchers, use all my traps are all hand tuned for increased efficiency. Moles have the ability shift soil an almost unbelievable amount of soil. The hills the moles produce are simply the soil removed from the ground while creating their network of feeding tunnels. Moles are territorial animals, with usually just one mole occupying a small area. However in a larger area there may me several moles all working their own small individual areas within the larger multi mole area. When one area becomes vacant another mole may take advantage and move in to the previously occupied area. Moles mate each spring and litters can number six of seven as soon as the young are old enough to move on they will look for their own area to work.